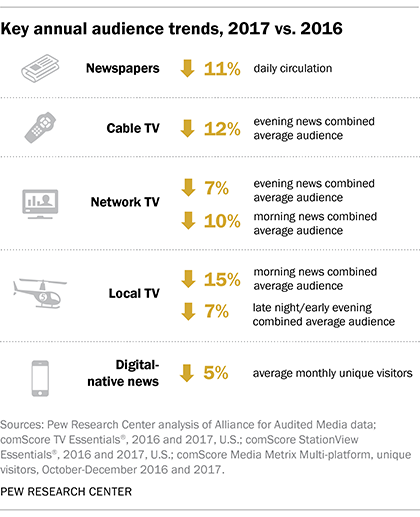 1 The audience for nearly every major sector of the U.S. news media fell in 2017 – with the only exception being radio. The evening audience for both local and network TV news declined 7%, while for cable it fell 12%, according to comScore TV Essentials® and StationView Essentials® data. Meanwhile, digital-native news sites’ audiences declined by 5% in terms of monthly unique visitors in 2017, according to comScore Media Metrix Multi-platform data. And the circulation for U.S. daily newspapers, whose audience has been steadily declining for several decades, fell by 11% last year, according to an analysis of data from the Alliance for Audited Media (AAM). 3 Cable networks stand out for revenue growth, and network news’ economic picture was stable. Revenue for cable news continued to rise, up by 10% in 2017, according to SNL Kagan estimates. Advertiser expenditures for network TV news were steady, according to estimates from Kantar Media. Radio, whose audience was largely steady, similarly held its own when it came to revenue, according to an analysis of MEDIA Access Pro & BIA Advisory Services data. 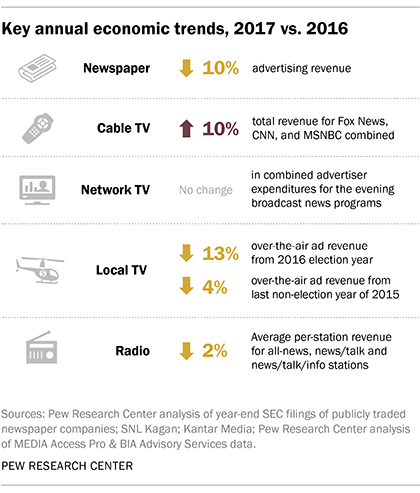 But newspapers continued to see their revenue decline with ad revenue falling 10%, according to an analysis of SEC filings by publicly-traded newspaper companies, and local TV news revenue was lower both than 2016 and slightly lower than for other recent off-election years (2013 and 2015), according to an analysis of MEDIA Access Pro & BIA Advisory Services data. These declines in revenue could potentially lead to reductions in newsroom staffing and resources for newsgathering. Newsroom employment has already dropped by nearly a quarter in less than 10 years, with the greatest decline at newspapers, according to a Pew Research Center analysis. Newspapers have also seen a consistent decline in revenue over the same period. 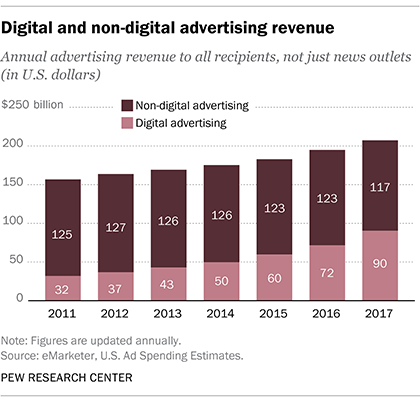 4 Digital advertising revenue continues to grow, but little of it benefits news organizations. Total digital advertising revenue has jumped 25% in 2017 across all types of digital outlets, not just news, according to eMarketer. This has been especially true of mobile advertising revenue, which totaled $61 billion in 2017, roughly equal to the total amount of digital advertising revenue just two years prior, in 2015 ($60 billion) – and which goes hand in hand with Americans’ increased use of mobile for news. However, news organizations seem to share little in this bonanza – 52% of all digital display advertising revenue goes to just two companies: Facebook and Google. 5Hispanic media also experienced audience declines. TV news audiences for both Telemundo and Univison, the two largest Hispanic television news networks in the U.S., fell across the board, in all major time slots for both their national and local news broadcasts. Newspaper circulation declined by at least 18% for the three daily Hispanic papers with 2017 data, though circulation at weekly Hispanic newspapers was about even. Univision’s revenue, however, was nearly the same as in 2016. Note: As the audience for online news continues to gain on traditional platforms, according to our survey work, it is important to note that some of the data above for different sectors do not fully include digital audience. The TV data, for example, measure live viewership so do not include the audience for those networks’ online videos and articles, and even though website audience metrics are available for these six networks, there is no clear measure that indicates how much of that audience is the same or different from the television audience. And while newspaper circulation measures both digital and print, some of the largest U.S. newspapers do not fully report their digital circulation to AAM. However, even with the most liberal estimate of this missing digital audience, digital gains would not make up for print declines. The one “pure digital” metric we have – traffic to digital-native news sites – showed a decline in 2017. To learn more: Explore all eight fact sheets on the state of the news media and the methodologies used to compile them.